Larger projects, such as architectural details or furniture, may require mallet tools, so named because they can be pushed through large amounts of waste wood with the aid of a heavy mallet. Mallet work requires a very stable work surface and clamping system to avoid the project moving while being repeatedly struck. Mallet tools can be pushed without a mallet in softer woods. 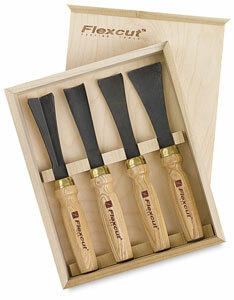 Every Flexcut mallet tool contains a high carbon steel blade affixed to an ash handle. ® Flexcut is a registered trademark.™ Flexcut is a trademark.